Kowalske Kitchen & Bath transformed two bathrooms in this 1940s Delafield cape cod. 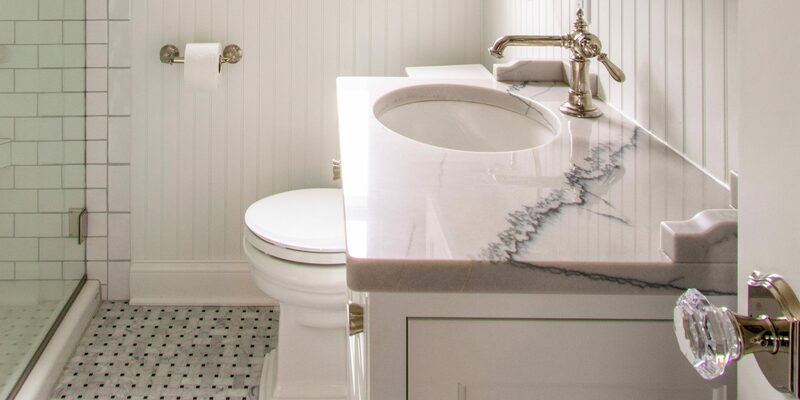 The goal was to restore the historic beauty of these bathrooms with carrara marble basketweave flooring, beadboard, custom cabinetry and quartzite counters. The walk-in showers feature subway tile, Kohler fixtures and custom glass doors. We added character with glass door knobs, three-panel doors, moldings, and etched custom lighting. We worked with the homeowner from concept through completion, ensuring every detail was perfect!